I can only try to imagine what goes through Jasper's or Lilah’s heads when they see that it has snowed. That said, it was pretty easy to guess the first time they encountered the cold white stuff on the ground last winter. Both dogs were thinking, “The ground is covered with Snacks!” If you’ve ever been to the beach and seen a black skimmer zipping across the water with its beak just touching the surface...that’s what my dogs were doing. They’d run along the ground with smiling mouths open, scooping up snow and gulping it down. It doesn’t get much better than that when you’re a dog. This year, the first snow of the season came in the form of a blizzard that dumped 13 or so inches in our yard. I took the dogs out several times during the height of it, and for the most part, it was too deep to Skim Snacks. However, there’s something about snow that brings out extra fun and nuttiness in dogs. 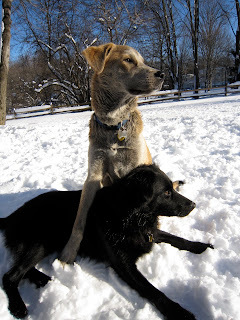 Jasper and Lilah ran--well, more like bounded--through the drifts, chasing each other, stopping to explore a completely changed landscape, and then chasing again. Exploring New Frontiers: While this may be a little challenging for Miss Lilah when the snow is up to her chest, it doesn’t stop her. She just Tiggers through the snow, sproinging like the bouncy friend of Winnie the Pooh. Jasper bounds as well, but with his long, long legs, he has the advantage and can explore a lot faster. If he feels like it. Sometimes, he just likes to stop and Survey the Area. 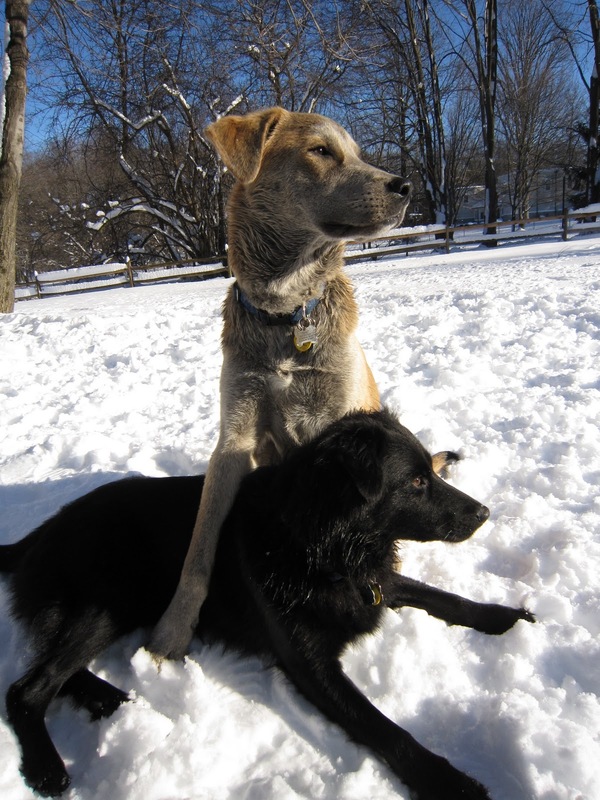 Professional Snow Wrestling: The object is to throw the other dog down and be the Big Dog on Top. Even though Jasper outweighs Lilah, and is much taller than her, under normal circumstances Lilah rules. Normally, she can outwit, out dodge, and out maneuver Jasper as she zooms behind bushes, zigzags across the yard or changes direction like a speedboat compared to his aircraft carrier. But with deep snow, Jasper can just knock her over into the fresh powder and jump on her. Half buried, it’s a bit of challenge for Miss Lilah to get back up, but she always manages it, and in a flurry of flakes she appears, taunting Jasper to just try it again. There’s Something Under There and I Have to Get It: One or other of the dogs usually starts this game by finding a Sniff that must be investigated further. Then the digging begins. As soon as someone starts digging, another someone has to join in, because whatever is Under There is Mine and I Saw it First. Often, all you’ll see are some happy, waggy butts sticking out from the snow. And I don’t know if the Somethings are ever found. But it doesn’t matter; the fun is in the search. I Got a Stick: The best sticks are the ones stolen from a snowman, thus dis-arming him (couldn't resist the expression), but sometimes you can find one just by happenstance. Or perhaps it was uncovered during a session of There’s Something Under There. The first thing you do with a stick is you chew on it. Then you run around, letting the other dog know that you have a stick and he or she Does Not. That’s My Stick: Of course, if Jasper has a stick, it really belongs to Lilah, and vice versa. A merry chase ensues with each dog taking back My Stick. Sometimes it results in a Stick Tug of War. Other times there are mutual chewing sessions, with Jasper and Lilah gnawing on different ends of the same stick. That’s My Frisbee: A variation of That’s My Stick, it should be noted that there are always two Frisbees available at all times. Two Dogs. Two Frisbees. Should make it easy. But The Other Dog always has The Best Frisbee. Even if you just took a Frisbee from The Other Dog; if he then picks up another Frisbee, then that one automatically becomes The Best One. This leads to lively discussions, chases and Frisbee tugs. When it looks like Lilah might win the tug, Jasper's best defense is to lie down; Lilah just doesn't have the strength to pull the Frisbee and The Moose. Inspired by my dogs’ love of snow, this year I decided not to build a snow man (or snow woman; we’ve done both in the past.) This was the year of the Snow Dog. Jasper Helped; if he didn’t think my snow sculpture was artistically appropriate, he fixed it. Which meant he simply removed chunks of snow in a variation of There’s Something Under There. A couple of Leave It commands convinced him that this was Not A Good Idea. And a few treats later, he and Lilah deigned to pose with my creation. Now barely recognizable remnants of the the Snow Dog remain. Just when the greengray grass was starting to peek through the snow cover, a few more inches were deposited. It’s just the beginning of January; more snowy winter games lie ahead.